This weekend was the Waterloo Air Show! I don't think I've been to an actual airshow in nearly 25 years. I don't remember much about that one except that I got a really, really bad sunburn. Part of the sunburn surrounded white finger marks where I'd applied sunscreen. I'm sure I saw planes then but I don't remember them. We didn't go to the actual show itself because the traffic into and out of the airport during the show is so bad. However, we could see (and feel) the F-16 from the house but we wanted a better view of all the planes. Since we live across the river from and just a bit north of the airport, we figured that by walking down to the river we could see quite a bit of the show. It turns out that we were right! We took our camp chairs and the camera and spent yesterday afternoon sitting by the river watching the planes and talking to the other people who were there. We found a shady spot with a bit of a breeze and settled in. It would have been better if it had been sunny because the sky was a flat grey but at least it was warm and a bit breezy. I have to say that sitting by the river watching the canoeists and planes go by is a very peaceful way to spend an afternoon. Well, it was mostly peaceful. This guy showed up with a beat-up boat and his wife and teenager in tow. The parents were definitely a little rough around the edges and he was a peace of work. He was rude and swore like a sailor, especially towards his wife. We were a little taken aback by the chainsaw, shovel, and garbage bags in the boat but since so many people saw him we figure he wasn't transporting a dead body. Apparently he takes the boat up the river and finds a place to camp. These places are either private property or part of the city park system and he puts up his own "no trespassing" sign. There aren't many people out there like this guy, that's for sure. While we could hear the fighter plane at home, it was so much louder at the river! I loved how I would see the plane and then hear it a few seconds later and how I would feel the noise in my body. it was clearly visible from our seat. 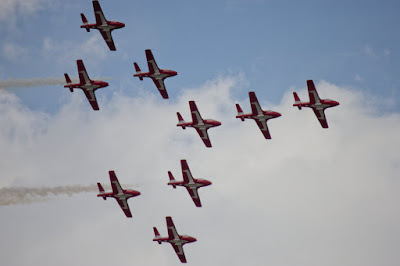 After the jet plane, we saw a biplane, the F-86 sabre, the P40-N Kittyhawk, the Canadian Harvard Aircraft Association formation team, the Canadian Forces SkyHawk Parachute Team, and the Canadian Forces Snowbirds. Each of the planes showed what they could do through rolls, upside-down maneouvers, and, in cases where multiple planes were in the air, different formations. It was really interesting to see the ways each different type of plane could move around. Unfortunately, our river vantage point didn't give us a great view of the Snowbirds, who closed the show. Therefore, this afternoon we walked along the river path to a point directly across from the airport where we had a fantastic view of the Snowbirds. They flew out directly over us - they were so close that I could see the numbers on the side! It was amazing to see them so close. Their show today wasn't as long as yesterday's show because bad weather moved in but it was great to see them so close, if even for a short time. I enjoyed seeing the planes much more than I thought I would. They're each so different and being able to see them and chat with people around us made for a very relaxing, interesting weekend. Next year we'll definitely watch the show again, weather permitting.